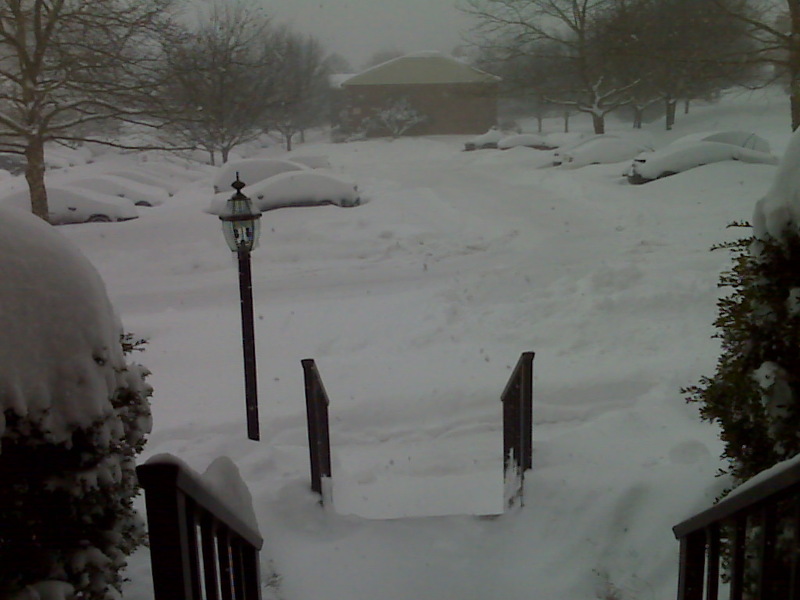 – Leave for work late since we had to wait on the snow plows. – Open front door (located directly underneath a covered awning) and realize two things: 1) The wind blew snow all the way up to our front door. 2) We can’t see the steps leading up to the front door. – Navigate snow-covered steps and experience life flashing before eyes. – Scrape snow off car and in doing so, manage to whack myself in the face with a shovel. Granted, the shovel was made of plastic, but still. I whacked myself IN THE FACE with it. No bueno, dudes. No bueno. – Singalong with Augs to Dave Matthews’ Ants Marching. Discover we don’t know all the words. At all. – Realize the drive isn’t that bad as long as we take it slow. – Cross third traffic light and immediately start to question status as first world nation. Road basically looks like the set from John Carpenter’s The Thing. – Get quasi-stuck in a snow bank. Augs somehow manages to get us unstuck and in doing so, becomes my hero. – Decide to trek up to the Blue Route. – Pass by the Philadelphia Pretzel Factory located right next to Starbucks. Do not stop. Do not purchase Americano the size of head and steaming hot soft pretzel. Continue to work. – Arrive at work. Step into the cold. Immediately lose sensation in extremities. – Mentally kick self for not purchasing aforementioned coffee and soft pretzel. – Have started regaining sensation in extremities. – Spent a quality chunk of time at the office. – Try to win tickets to Dave Matthews concert via radio station. Fail. – Come home to find a delivery from Mark. Discover that I love the smell of lemon sugar. – Eat pizza, shower, change into a shirt from 2001 and start feeling human again. – Realize Real Time with Bill Maher is on tonight. Rejoice! – Make plans with Augs to hit up Shutter Island and Classic Diner tomorrow. – Day ends up being much better than it started.